Li-Lac, "Manhattan's Oldest Chocolate House" recently opened shop in the Shops at Hudson Yards, home to over 100 exclusive luxury and specialty stores and restaurants covering about 720,000 square feet of New York City. It's the sweetest spot in Hudson Yards! 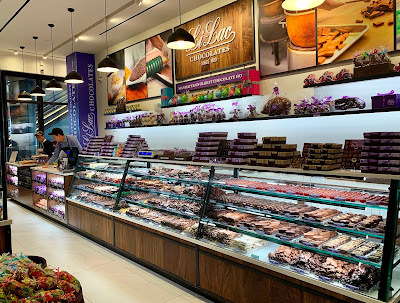 The new Li-Lac location carries on the tradition of handcrafted, small batch chocolate that first began with a quaint little shop founded by French-trained George Demetrious on Christopher Street in 1923. Over the years, the brand has blossomed and is currently tended to by owner Anthony Cirone, Chris Taylor and Master Chocolatier Anwar Khoder, who provide one of the largest gourmet chocolate selections in the country. 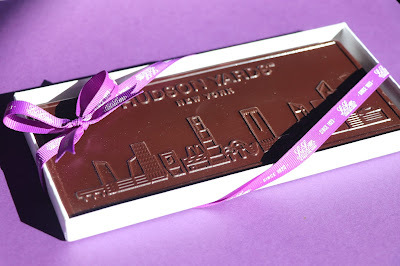 The Hudson Yards shop carries their full line of chocolate assortments, NY-themed chocolate gifts and specialty molds--look for the introduction of their 72% extra dark, dairy-free chocolate bar featuring a tribute to the striking Hudson Yards skyline (see above). Chocolate lovers may also delight in the on-site chocolate tempering wheel, but are asked not to tamper with it, however tempting it may be! All the fudge is cooked to provide a smooth texture that is less grainy than mixed fudge. Delicious bites of maple walnut, mocha and regular fudge are shown, top tier; chocolate covered pistachio marzipan, middle tier; chocolate covered coconut, bottom tier. Don't forget about Easter bunnies, specialty chocolate assortments, and colorful jelly beans for all the young ones--including the young at heart! How sweet it is, indeed! Li-Lac Chocolates locations: Hudson Yards (10th Ave @ 32nd St); West Village (40 8th Ave @Jane St). Greenwich Village (162 Bleecker St, btw Sullivan/Thompson); Grand Central Market (43rd St & Lexington Ave); Chelsea Market (75 9th Ave @ 15th St); Brooklyn Factory/Store (68 35th St, btw 2nd/3rd Aves, Brooklyn. Visit www.li-lacchocolates.com for more information.